Can I Claim My Home Office As A Deduction on My Taxes? You are here: Home / Taxes / Can I Claim My Home Office As A Deduction on My Taxes? It has been said that the IRS’ job is to get as deep into your pockets as possible. Your job on the other hand is to do all that you can within the guidelines of U.S. tax laws in order to keep the IRS out of your pockets as much as possible. 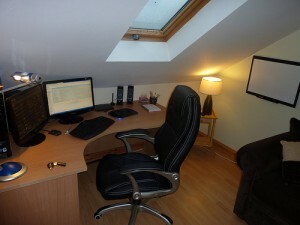 One way to reduce your tax liability is to claim a home office deduction. First of all, before you get super excited about the idea of savings hundreds, or even thousands of dollars, off your IRS tax bill, it is very important to understand that the home office deduction acts as a sort of red flag with the IRS. If you work from home in the total merchant services industry, for example, and claim a home office, your chance of being flagged by the IRS and audited rises. Therefore, only claim your home office as a deduction if it meets IRS requirements. If you are unsure whether your use of your home office does qualify, then contact a local tax attorney for clarification. Your home office must be exactly that—your office. You wouldn’t entertain friends and family members at your office if you worked in corporate America, would you? The same needs to be true for your home office. If your home office acts as an office during the day, and the family game room at night, the IRS does not allow you to deduct the space as a home office. The IRS requires your home office to be a part of your home that you use regularly and exclusively for your small business operations. Your home office also must be your principal place of business. In other words, if you have a corporate day job, and your workload requires you to work on more paperwork at night when you get home, you cannot claim your home workspace as a home office because it is not your principal place of business. For a full explanation of tax laws and deductions for your home office, refer to Publication 587, “Business Use of Your Home,” on the IRS website. This publication goes into great detail concerning all of the requirements of home office space and how you can claim those deductions on your IRS tax return in order to lower your tax liability and save money.